Swiftly following the awesome ‘Ate the Wrong Mushroom’ sculpt we posted last week, Chris Moore of We Become Monsters is proud to present yet another upcoming exhibition piece, this time around for Killer Bootlegs‘ ‘Toys Are Us’ group show… Entitled ‘Brasscoat Dimension Hopper’, the articulated resin figure stands at an impressive 5.5″ tall, coming with a unique coating of brass powder and black shoe polish. Limited to just one piece for this initial release, Chris has stated that we’ll be seeing a number of variants in the WBM store throughout spring… Expect details on those as soon as we hear anything! 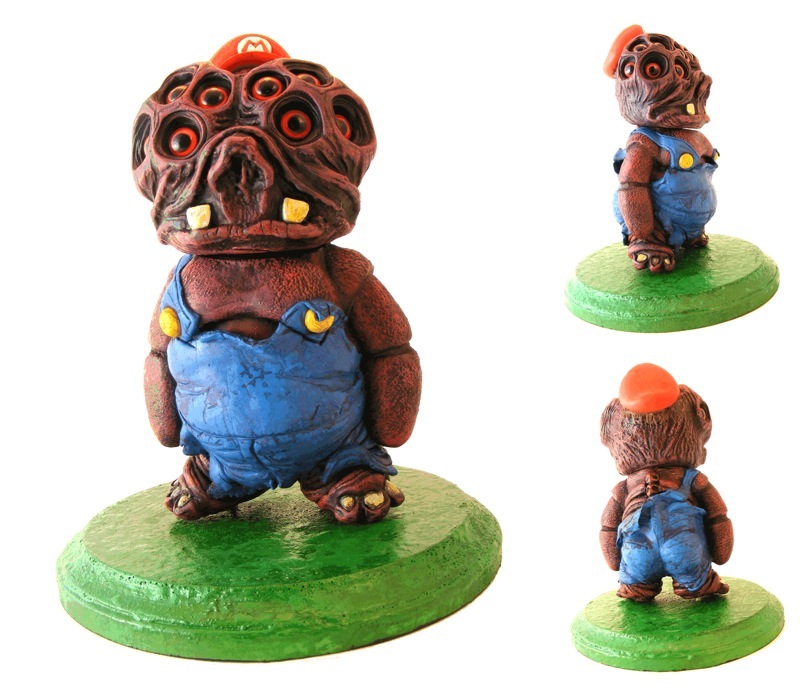 Chris Moore aka WeBecomeMonsters kindly share details of his latest one-off custom sculpt, “Ate the Wrong Mushroom”… Created for 1AM‘s upcoming GAME ON group show, the absolutely stunning piece depicts everyone’s favourite plumber in the unmistakable WBM style, featuring deep textures, grotesque flaps, multiple eyes and a suitably grimy paint job. As mentioned before this guy is unfortunately just a one off, but Chris has stated that the base resin figure used, entitled “The Hell?”, will be making it’s debut shortly… More news on that as soon as we hear anything! 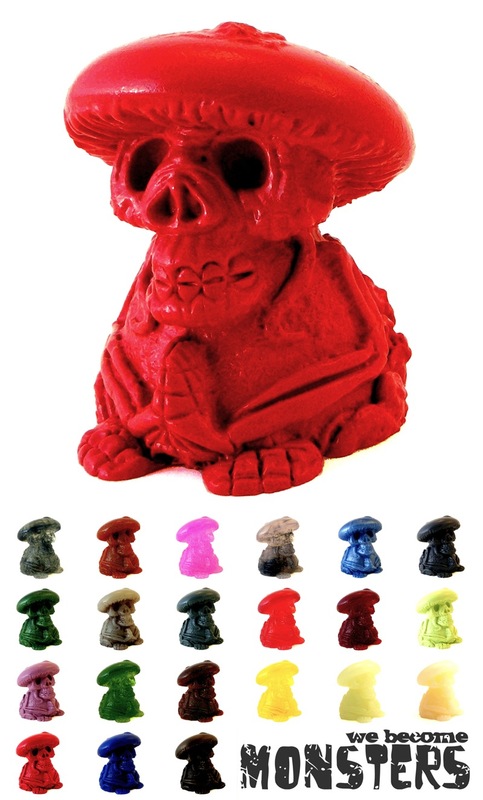 Originally created as part of the Dead Hand x Tenacious Toys Resin is King: Series 2, Chris Moore over at WeBecomeMonsters has just revealed that his “Amanita Must Scare Ya” Death Cap resin is now set for it’s first stand-alone release! 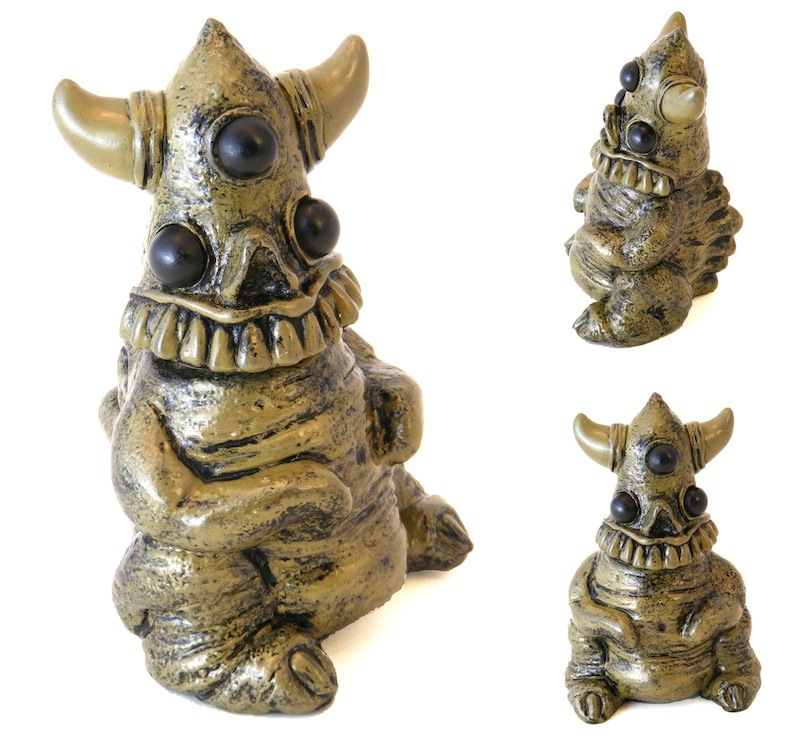 Standing at around 3″ tall, Chris will be offering up 3 different versions of the figure across and edition of 26; 4 Glow-in-the-dark, 4 cold-cast bronze and 18 one-off colourways. 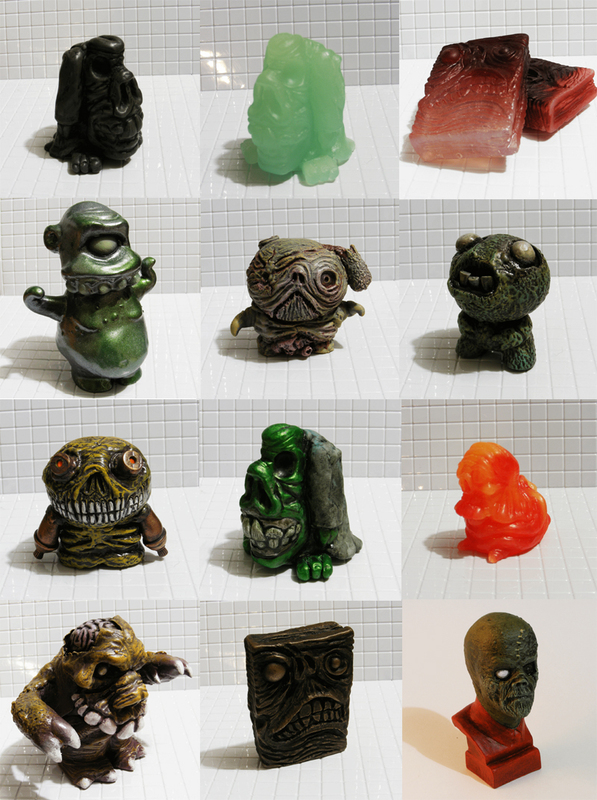 Priced at just $25, $45 and $22 respectively, the little guys will be hitting the WBM store on Thursday, March 7th at Noon Eastern time… Chris has stated that all orders will also include a completely FREE micro resin SLAB (whilst stocks last), plus entry into the random drawings for a full sized version! Taking one of our favourite Motorbot resins from the past year, the 2-headed zombie ‘Zed’, Chris of We Become Monsters has transformed the piece into an awesome, aquatic, tentacled nightmare… presenting the Zedtopus! Stripped of it’s original mossy finish, the 2.5″ mini figure comes with a newly acquired set of sculpted tentacles, painted in Chris’signature grimy palette and finished with a definition-popping black rub. 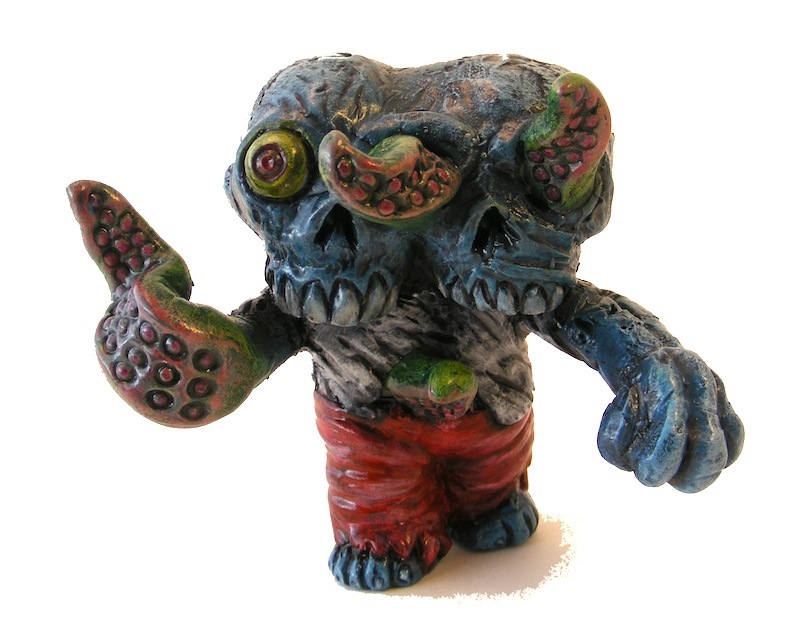 Available through the WBM store right here, Zedtopus can be yours for just $35 plus shipping. 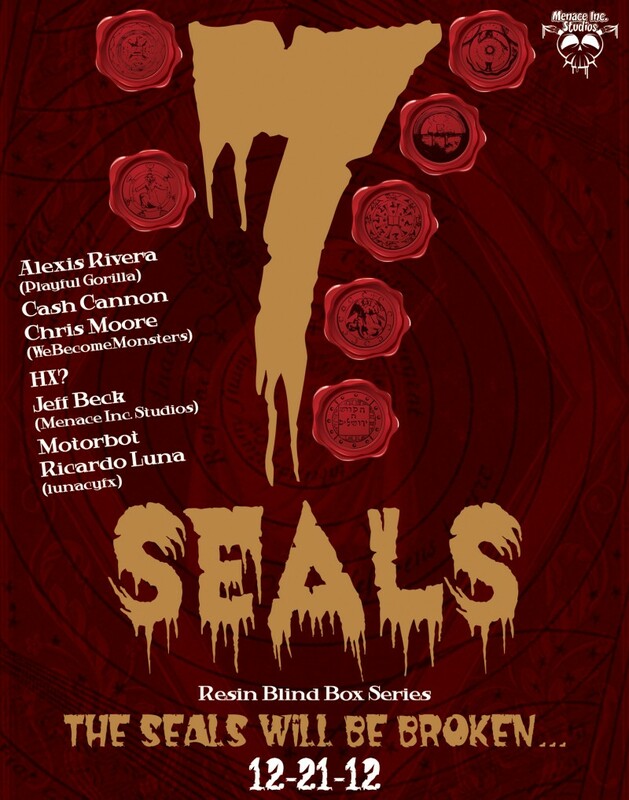 Fresh from the huge success that was “The Rise of the Samhain“, Jeff Beck over at Menace Inc teases us with the first promo image from the studio’s debut collaborative art toy project… the 7 Seals! Due to feature some of the resin scene’s finest including Cash Cannon, We Become Monsters, Motorbot, and of course Jeff himself, the series is set to come blind boxed, with a Christmas release of December 21st. No news as of yet as to what will be featuring in the series (although we’re guessing wax seal designs must feature! ), so be sure to stay tuned for more reveals and release info to follow very soon! Hot off the heals of his recent Mini Galaxy Frankenstein bust, Chris Moore of We Become Monsters is proud to reveal his latest resin release, the absolutely hilarious NECROLAMEICON! Taking inspiration from Evil Dead’s iconic “Book of the Damned”, the 2.5″ tall “book/toy/thing” has once again been cast in Chris’s staggering selection of colours, including opaque, clear, metallic and GID tints… gauging from the included press shot, there’s nearly 70 one-off designs! 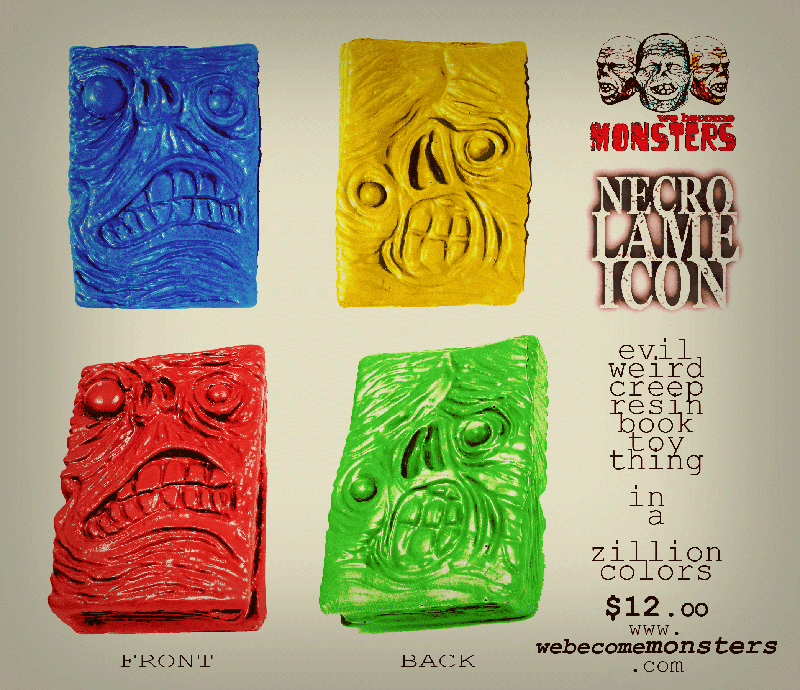 Priced at just $12 plus shipping, the NECROLAMEICON will be available from the We Become Monsters store as from 5pm EST today. 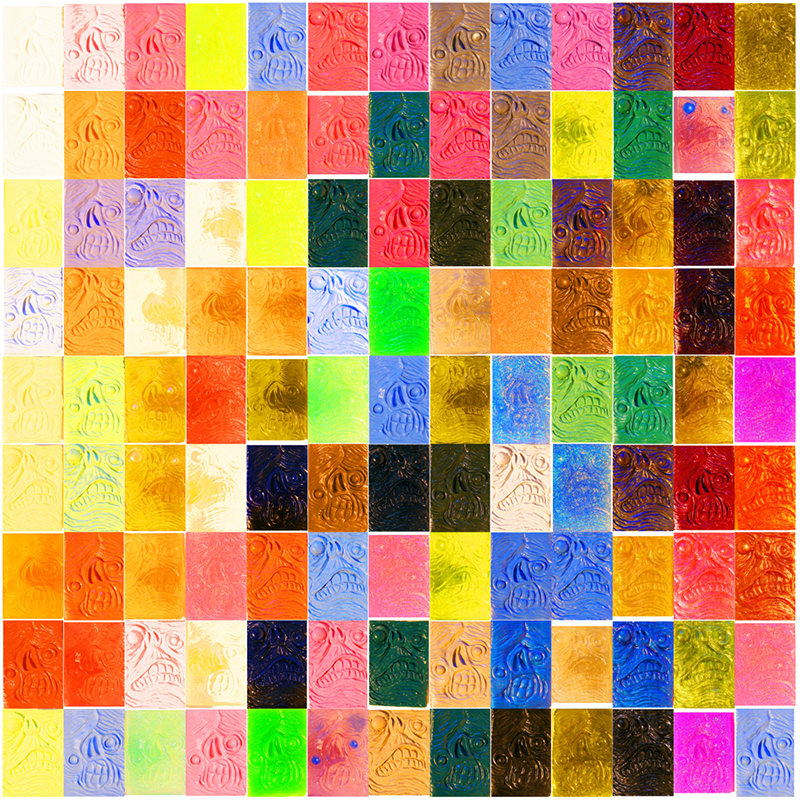 Chris has also stated that early purchasers will also recieve a free 2″x3″ Mini Slab whilst stocks last!